Past, present and (fictional) future meet in an exciting design: Cutting-edge engraving and finishing technologies bring the selectively coloured image to life, while the Star Trek font adds an authentic vintage feel! Your purchase is protected by The London Mint Office 14 day “no quibble” return guarantee. You have no further obligation. 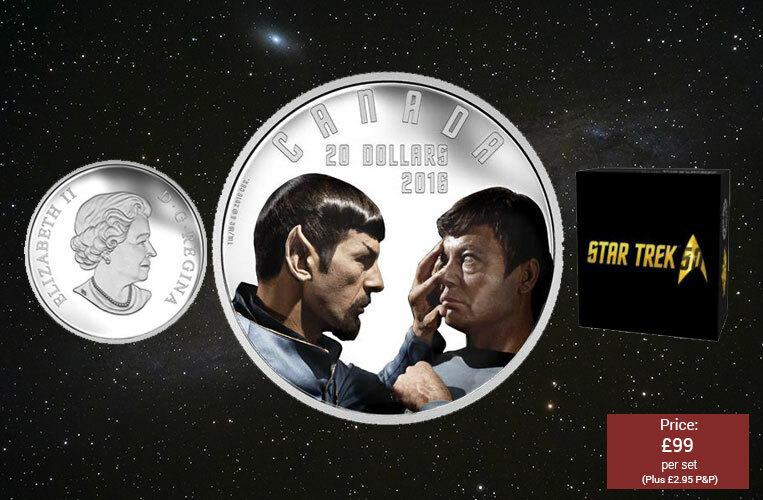 The reverse design recreates a key scene from the memorable 1967 Star Trek episode. Selective colour enhances the engraved image of an alternate version of Mr. Spock (portrayed by Leonard Nimoy) performing a Vulcan mind meld on Dr. Leonard “Bones” McCoy (portrayed by DeForest Kelley). McCoy bears a fearful expression while Spock sports an uncharacteristic goatee and altered uniform—evidence that the away team is in a mirror universe where their fellow crewmembers are behaving very differently.s The Guardian of Forever.